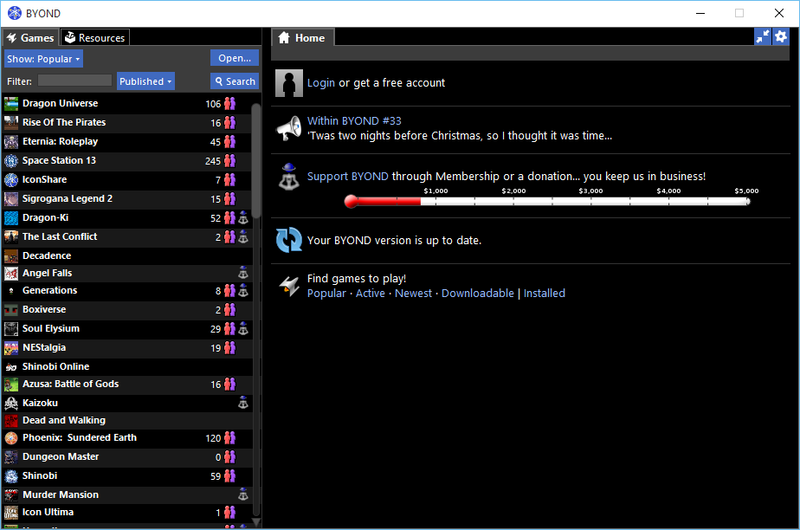 BYOND is both a gaming engine and a gaming community. It is a complete system to create, play, and publish games. The BYOND software suite is an online game platform in a nutshell, with a focus on online multiplayer games. It has many great classic or retro style games. With the easy-to-learn DM language, BYOND lets anyone make online multiplayer games. BYOND blurs the lines between players and developers. If you are new to programming or game development, BYOND is a great place to start. BYOND Client - The core of the BYOND software suite. It allows players to easily find games to play. It can automatically download and install any freely available BYOND game. It also lets developers search for and download game development resources and libraries. You can even use it to chat with other users. The BYOND client can alert you when new updates are available or when you receive new messages. Dream Maker - A powerful IDE and compiler with tools for editing game code, interfaces, icons, and maps. Dream Seeker - The game client that lets you connect to and play online games. It can also locally run games offline. Dream Daemon - A hosting tool for online games.